Salt Lake City, Utah: The University of Utah Press, 2005. 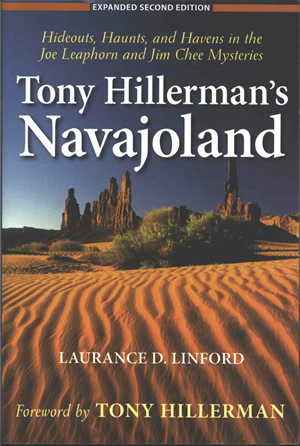 This is the expanded second edition of Tony Hillerman's Navajoland: Hideouts, Haunts, and Havens in the Joe Leaphorn and Jim Chee Mysteries by Laurance D. Linford, with a Foreword by Tony Hillerman. The front cover photograph depicts dramatic red sandstone formations rising above a grouping of desert vegetation, with windswept ridges of red sand extending into the foreground. The book's title and the author's name are printed in white overlaid on the photo. The back cover displays a description of the book's content and praise quotes printed in white on a medium blue background. The publisher's imprint and bar code are printed at the bottom of the back cover. The inside front and inside back covers are blank. Binding: Full-color paper covers. On the spine, the book's title is printed in large yellow type on a medium blue background above the author's last name, printed in white, and the publisher's logo.